The denial of certain defence documents’ pertaining to purchases made during the Kargil war, to the Public Accounts Committee of Parliament reverberated today with a determined Opposition forcing the adjournment of both Houses. In an attempt to bring political stability and supplement the anti-defection law the Centre has proposed to bring a legislation to limit the size of ministries in smaller states. Stressing that there had been no report on the Operation Vijay, the BJP today clarified that the government had absolutely no reservation in discussing the Central Vigilance Commission report on defence deals. Shehnai maestro Ustad Bismillah Khan was today honoured by the Punjab Chief Minister, Capt Amarinder Singh, at a function in the Capital. Soft drinks giant Pepsi today filed a petition in the Delhi High Court seeking to restrain in NGO, the Centre for Science and Environment, from publicising its report about the alleged presence of pesticides in soft drinks being manufactured by multinational companies in the country. Sporadic incidents of violence at different places marked the Congress-sponsored Gujarat bandh today while state Congress chief Shankarsinh Vaghela, Leader of the Opposition Amarsinh Choudhary and other leaders were arrested when they tried to take out a rally here. 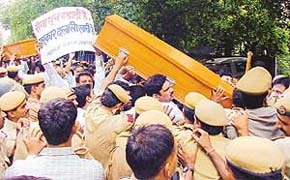 The Indian Youth Congress today took out a “coffin march” to the house of Defence Minister George Fernandes. Shouting slogans ‘Sena khoon bahati hai, sarkar dalali khati hai,’ and ‘BJP ka dekho haal, raksha sauduan ke bane dalal,’ the activists were carrying empty coffins. Carrying coffins, Youth Congress demonstrators try to break the police cordon outside the residence of Defence Minister George Fernandes in New Delhi on Friday. The CPM today expressed shock over the recent judgement of the Supreme Court disapproving of participation of government employees in strikes saying that the apex court may be moved for a review of the judgement. After ordering release of RJD president and former Bihar Chief Minister Laloo Prasad Yadav’s passport yesterday, the Supreme Court today permitted him to visit Pakistan as part of a goodwill mission of MPs and journalists, leaving for Islamabad tomorrow. 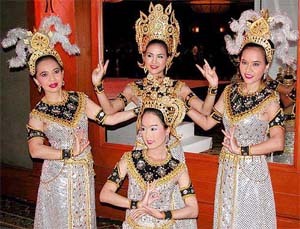 Thai artistes present their traditional dance at a function to promote the country's tourism sector, in Mumbai on Thursday night. Punjab Chief Minister Captain Amarinder Singh today expressed the confidence that the BJP-led NDA government would not succeed in destabilising the Congress government in the state. Punjab Chief Minister Captain Amrinder Singh today indicated that the state would impose local area development tax in place of octroi. Addressing newspersons here today, he said the octroi was reimposed in the state following the High Court directive. Barely a week after Prime Minister, Mr Atal Bihari Vajpayee stressed the need to reduce the large gap between the number of good schools and average ones, a nationwide campaign for seeking a common school system was launched today with children, teachers and people joining hands to form a human chain. As investigations began into the recent helicopter crash near Srinagar in which five persons were killed, a preliminary probe into the case has found the chopper had no licence to fly on a commercial basis. Preparations are on for a new cross-border bus service linking Dhaka and Agartala. The service would be launched next month. The denial of certain defence documents’ pertaining to purchases made during the Kargil war, to the Public Accounts Committee (PAC) of Parliament reverberated today with a determined Opposition forcing the adjournment of both Houses. Both Houses would now meet on Wednesday, after a four-day break, in view of Raksha Bandhan on August 12. The trouble started in the Lok Sabha when Speaker Manohar Joshi was about to take up a discussion on atrocities on Dalits. The Speaker’s pleas for taking up a special discussion on atrocities on Dalits, as it had already been postponed twice, failed to have any impact. Unrelenting Congress members trooped to the well, shouting “PAC lachar hain, ghotale ki sarkar hain (PAC is helpless, it is a government of scams)”. Congress members also raised the issue of the raid on its Gujarat State Committee offices. Mr Joshi first adjourned the House for half-an-hour till 2.00 pm. After the House reassembled, the Speaker found no change in the attitude of the Congress members and adjourned the House for the day. In the Rajya Sabha too, the PAC issue dominated. Led by the Congress, Opposition members reflected their strength in the Rajya Sabha after forcing the adjournment of the Lok Sabha, yesterday. They were on their feet immediately at the start of the day’s proceedings, demanding the suspension of question hour to take up the discussion on the notice given by Congress member Suresh Pachauri. The demand was not acceptable to the members of the Treasury Benches, who matched the Opposition members voice by voice, leading to complete confusion. Chairman Bhairon Singh Shekhawat gave an assurance that the CVC report would be made available to the House. But this did not satisfy members who said the impasse would continue unless their demands were met. This forced Mr Shekhawat to adjourn the House till August 13, the next working day for Parliament. Mr Pachauri was the first to be on his feet demanding the suspension of question hour. The entire Opposition then joined him making it clear that the deadlock would continue unless all PAC proceedings, including the Central Vigilance Commission’s report on purchases for Operation Vijay are placed on the table of the House and the reply comes from Prime Minister Atal Bihari Vajpayee and not Defence Minister George Fernandes. Senior Congress member Pranab Mukherjee said the matter involved the breach of privilege of Parliament. The Treasury Benches, led by BJP member S.S. Ahluwalia, said, like the Opposition, they too would like to know why the CVC report was not made available to the PAC. 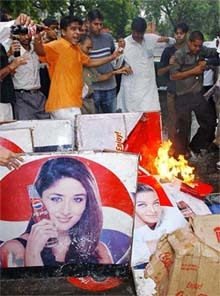 The stalemate continued since the Opposition was in no mood to relent their boycott of Mr Fernandes. “There should be check on the number of ministers in governments like Delhi and Pondicherry, which are union territories but have Assemblies. This will help bring political stability and benefit smaller states,” Deputy Prime Minister L. K. Advani said in the Lok Sabha today. The Deputy Prime Minister was making a brief reply to the debate on the Constitution (99th Amendment) Bill, 2003, for the creation of the Bodo Territorial Council. The Bill seeks to protect the rights of non-tribals and the exiting representation of Scheduled Tribes and non-Scheduled Tribes in the Assam Assembly from the Bodoland Territorial Council Area. Mr Advani dismissed allegations by the Congress that the ruling party at the Centre was instrumental in “destablising” the earlier Mukut Mithi government in Arunachal Pradesh. Observing that a decision on establishing the council was taken after 21 rounds of tripartite talks involving the Centre, Assam Government and the Bodo Liberation Tigers, Mr Advani asserted that no changes in the boundaries of states in the North-East would take place, despite pressures from various quarters. The Bill provides that no person who is not a member of Scheduled Tribes of any autonomous district in Assam will be eligible for election to the Assembly from any constituency of the Bodo district. The Lok Sabha today passed the 94th Constitutional Amendment Bill paving the way for the setting up of a separate three-member National Commission for Scheduled Tribes. The National Commission for Scheduled Tribes is being created to protect the rights of the tribal community as enshrined in the Constitution. The new commission will come under the ambit of the Ministry of Tribal Affairs. Stressing that there had been no report on the Operation Vijay, the BJP today clarified that the government had absolutely no reservation in discussing the Central Vigilance Commission (CVC) report on defence deals. BJP Parliamentary Party spokesman Vijay Kumar Malhotra said the CVC had probed all deals that had taken place in the Defence Ministry from 1989 to 1999. Any discussion on the CVC report would not involve anyone in the BJP-led NDA coalition as it concerned Congress and United Front governments, he informed. 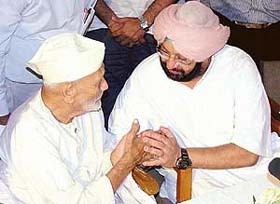 A day after the maestro cast his musical magic on the parliamentarians, Capt Amarinder Singh presented a cheque for Rs 5 lakh with an assurance that the state would help the Bharat Ratna whenever needed. The state government had earlier announced a financial assistance of Rs 2 lakh to the maestro, when he appealed to the Prime Minister that he was in a financial dire straits. The Chief Minister also announced that the state government was working on a scheme for providing financial assistance to renowned persons in different fields by setting up a corpus fund for them. They would be provided with life-long financial assistance for their contribution to society during their active times, he added. Soft drinks giant Pepsi today filed a petition in the Delhi High Court seeking to restrain in NGO, the Centre for Science and Environment (CSE), from publicising its report about the alleged presence of pesticides in soft drinks being manufactured by multinational companies in the country. Pepsico India Holding’s Director C.K. Jaipuria filed the petition through its counsel in the High Court Registry this afternoon. It is likely to come up for hearing on August 11. The company in its writ petition, has named the Centre, the Union Health Ministry, the Bureau of Indian Standards and the CSE as respondents. Meanwhile, the CSE today blamed the government for lack of adequate regulations for the soft drinks industry. Cola companies cannot determine the regulations they will follow, centre’s director Sunita Narain said. The police arrested Mr Vaghela, Mr Choudhary, a former Deputy Chief Minister Narhari Amin and Mr Bhavan Bharwad, MLA from Limdi, besides others when they tried to take out a rally from the Congress headquarters in the Ellis Bridge area and were taken to the police headquarters at Gandhinagar. The Indian Youth Congress today took out a “coffin march” to the house of Defence Minister George Fernandes. Shouting slogans ‘Sena khoon bahati hai, sarkar dalali khati hai,’ and ‘BJP ka dekho haal, raksha sauduan ke bane dalal,’ the activists were carrying empty coffins. They were stopped by the police outside the residence of the Defence Minister. Condemning the Central Government for its “dictatorial attitude and conspiracy to mislead the nation, the Indian Youth Congress chief Mr Randeep Singh Surjewala said “corruption of the BJP stood exposed.” He said the government was not furnishing the CVC report either to the Public Accounts Committee (PAC) or Parliament. Of 123 contracts worth Rs 2163.09 crore entered into during the Operation Vijay, supplies worth Rs 2,150 crore were received after the cessation of hostilities in June 1999, he added. Alleging that 75 per cent of the supplies were contracted after the cessation of hostilities, he said in 35 cases the government made excess payment of Rs 44.21 crore by illegally relaxing rules and procedures. Mr Surjewala said defence supplies worth Rs 260.55 crore were not of desired quality and the shelf life of ammunition worth Rs 91.86 crore had expired. He said several such facts could be verified from the CVC report submitted to the Defence Ministry on March 31, 2001. Demanding the dismissal of the Defence Minister, he alleged that the Defence Ministry continued to deal with middle men. A Youth Congress spokesman said several activists, including Mr Surjewala, were detained by the police. Asserting that the Supreme Court ruling would convert employees into “slaves”, CPM leader Somnath Chatterjee asked the government to immediately clarify its stand on the matter. He said the working class all over the world enjoyed the rights to strike and government workers were also part of this working class. A three-judge Bench, headed by Mr Justice S.N. Variava granted permission to Mr Laloo Prasad Yadav, an accused in seven fodder scam cases, to stay abroad till August 17 after he had furnished an undertaking that he would not object to any evidence recorded in his absence by the trial courts at Ranchi and Patna in each of the cases and create hindrance in the trial proceedings. The court made it clear to Mr Laloo Prasad Yadav’s counsel B.B. Singh that the RJD leader should positively return by August 17 and deposit his passport by the next day with the trial court. “The NDA government would not succeed in Punjab what it was able to achieve in Arunachal Pradesh,” he told newspersons here today. Reports indicated that Punjab leaders had informed the Congress high command that some disgruntled partymen, including some ministers were “hobnobbing” with the SAD-BJP combine to further their own interests. They also impressed upon the fact that the joining of the three Independent MLAs to SAD should not be overlooked. Mr Amarinder Singh said the party’s stand was clear that the partymen should air their views within the party and not in media. And, this fact was again reiterated at the Shimla meet held recently. Punjab Chief Minister Captain Amrinder Singh today indicated that the state would impose local area development tax in place of octroi. Addressing newspersons here today, he said the octroi was reimposed in the state following the High Court directive. But, the Congress had always been against it and it was one of the items of the party’s manifesto. The octroi, which is unpopular amongst the trading community, generated only Rs 580 crore to the exchequer. The local area development tax, on the other hand would generate substantial sum to the kitty of the state government. Raw material worth Rs 36,000 crore enter the state and imposition of even 2 per cent tax would generate Rs 720 crore, Captain Amrinder Singh, adding that only that much quantum of tax would be imposed which would compensate the octroi. He said one time tax would be imposed on goods entering the state and would do away with the existing system of taxing the goods as they enter different municipal zones. He said the panchayat institutions in the state would be given powers to oversee the function in five areas. Barely a week after Prime Minister, Mr Atal Bihari Vajpayee stressed the need to reduce the large gap between the number of good schools and average ones, a nationwide campaign for seeking a common school system (CSS) was launched today with children, teachers and people joining hands to form a human chain. The campaign was launched in 14 state capitals, simultaneously to stress the need for equality in education and reducing the divide between public and government schools. The campaign, which is yet to receive a response in Punjab and Haryana, is being supported by the National Alliance for Fundamental Right to Education (NAFRE). “Today, the most critical factor absent in the education scenario is equality in education and educational opportunities. Whether it is the Sarva Shiksha Abhiyan 2002, the 93rd Amendment Bill of 2001, the Birla-Ambani report 2000, or the National Curriculum Framework 1999, equality has always been glaringly conspicuous by its absence”, said Mr Sanjiv Kaura, national convener, of the NAFRE. “Every second child is still out of school. And for those who are in school, every second school is a single-room, school with only one teacher, he claimed. Four million teachers were needed in the country, he added. “If there is a government school, where the children of the economically weaker sections study along with the children of and the rich, the government will ensure that the school is run well”, an NAFRE member said. Mr Kaura said, “the CSS will be operationalised through the neighbourhood school that is funded by the government, but controlled by the community around it. The quality offered will be such that no parent feels the need to send their children to expensive schools. Education, as stipulated in Article 21 of our Constitution, would be free”. As investigations began into the recent helicopter crash near Srinagar in which five persons were killed, a preliminary probe into the case has found the chopper had no licence to fly on a commercial basis. Aviation officials conducting the probe confirmed that BEL-407, which crashed on August 5, killing five persons, including the pilot, was not meant for commercial operations.